Scientists at the University of York have shown that the way we speak to our canine friends is important in relationship-building between pet and owner, similar to the way that &apos;baby-talk&apos; is to bonding between a baby and an adult. 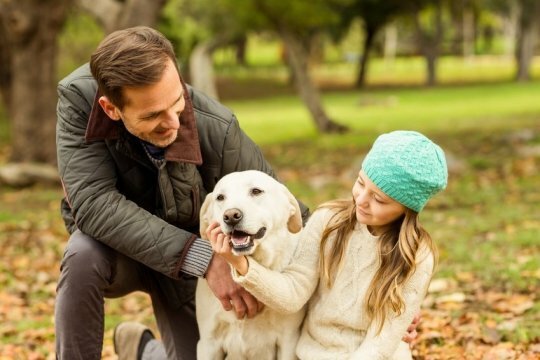 Speech interaction experiments between adult dogs and humans showed that so called "dog-speak" improves attention and may help humans to socially bond with their pets. Researchers at York tested this theory with new experiments designed to understand more about why humans talk to dogs like this and if it is useful to the dogs in some way, or whether humans do this simply because they like to treat dogs in the same way as babies. Dr Katie Slocombe from the University of York&apos;s Department of Psychology said: "A special speech register, known as infant-directed speech, is thought to aid language acquisition and improve the way a human baby bonds with an adult. This form of speech is known to share some similarities with the way in which humans talk to their pet dogs, known as dog-directed speech. "This high-pitched rhythmic speech is common in human interactions with dogs in western cultures, but there isn&apos;t a great deal known about whether it benefits a dog in the same way that it does a baby. "We wanted to look at this question and see whether social bonding between animals and humans was influenced by the type and content of the communication." Unlike previous experiments, the research team positioned real humans in the same room as the dog, rather than broadcasting speech over a loud speaker without a human present. This made the set up much more naturalistic for the dogs and helped the team test whether dogs not only paid more attention more to &apos;dog speak&apos;, but were motivated to spend more time with the person who had spoken to them in that way. Researchers did a series of speech tests with adult dogs, where they were given the chance to listen to one person using dog-directed speech containing phrases such as &apos;you&apos;re a good dog&apos;, and &apos;shall we go for a walk?&apos;, and then another person using adult-directed speech with no dog-related content, such as &apos;I went to the cinema last night.&apos;. Alex Benjamin, PhD student from the University&apos;s Department of Psychology, said: "We found that adult dogs were more likely to want to interact and spend time with the speaker that used dog-directed speech with dog-related content, than they did those that used adult-directed speech with no dog-related content. "When we mixed-up the two types of speech and content, the dogs showed no preference for one speaker over the other. This suggests that adult dogs need to hear dog-relevant words spoken in a high-pitched emotional voice in order to find it relevant. "We hope this research will be useful for pet owners interacting with their dogs, and also for veterinary professionals and rescue workers."